Bryan Stevenson, founder and executive director of the Equal Justice Initiative, is the winner of the annual $100,000 Puffin/Nation Prize for Creative Citizenship. The award honors work that challenges the status quo through distinctive, courageous, imaginative, and socially responsible work of significance. It is intended to encourage the recipients to continue their work, and to inspire others to challenge the prevailing orthodoxies they face in their own lives. The award will be presented to Stevenson at The Nation Institute's 50th Anniversary Gala Dinner on December 6 in New York City. Stevenson is a widely acclaimed public interest lawyer who has dedicated his career to helping the poor, the incarcerated, and the condemned. Under his leadership, the EJI has won major legal challenges eliminating excessive and unfair sentencing, exonerating innocent death row prisoners, confronting abuse of the incarcerated and the mentally ill, and aiding children prosecuted as adults. Stevenson has successfully argued several cases in the United States Supreme Court, including an historic ruling that mandatory life-without-parole sentences for all children 17 or younger are unconstitutional. Stevenson and his staff have won reversals, relief, or release for more than 115 wrongly condemned prisoners on death row. Stevenson has initiated major new anti-poverty and anti-discrimination efforts that challenge the legacy of racial inequality in America, including major projects to educate communities about slavery, lynching, and racial segregation. Stevenson has been representing capital defendants and death row prisoners in the Deep South since 1985, when he was a staff attorney with the Southern Center for Human Rights in Atlanta, Georgia. His New York Times bestseller, Just Mercy, which won the Carnegie Medal for Nonfiction and the NAACP Image Award for Nonfiction, among honors, was released in 2014. A 1985 graduate of Harvard, with both a master's in public policy from the Kennedy School of Government and a JD from the School of Law, Stevenson joined the clinical faculty at New York University School of Law in 1998. "I'm truly honored by this extraordinary recognition and the incredible support," said Bryan Stevenson. "As someone who has spent most of my career working with people made invisible through mass incarceration or marginalized by excessive punishment, poverty, and racial bias, it's deeply affirming and encouraging to receive such a prestigious honor." 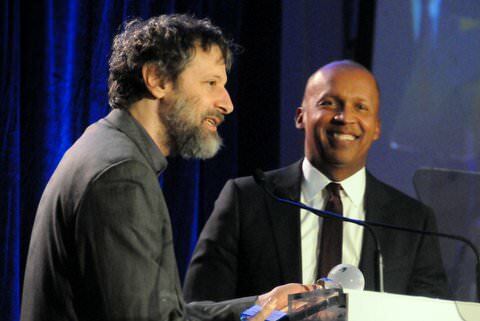 Perry Rosenstein, President of the Puffin Foundation, said, "Bryan Stevenson has dedicated his career to helping the poor, the incarcerated and the condemned through his organization the Equal Justice Initiative. He has provided legal representation to people who have been illegally convicted, unfairly sentenced, or abused in state jails and federal prisons. In the words of Nobel Peace Prize Winner Bishop Desmond Tutu, Bryan Stevenson is 'shaping the moral universe…. Justice needs champions, and Bryan Stevenson is such a champion.'" Taya Kitman, Executive Director and CEO of The Nation Institute, said, "We couldn't be more proud to honor Bryan Stevenson and the Equal Justice Initiative, especially this year. He's a true champion for those who need his help the most, and his unparalleled dedication to one of our most pressing issues, prison reform, has inspired us for years. He challenges us to imagine a better system while improving the current one, and to understand how our country's racial history has brought us to where we are today."